The GM’s trucks are one of the best and performance oriented truck on the market and now the General Motors made certain enhancements to some of its high end trucks to make them reliable. In this scenario, the GM’s engineers designed and crafted the new 2014 Chevrolet Silverado to be the most long lasting and reliable. 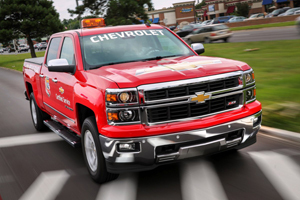 The 2014 Silverado gets a roof and all body panels made of zinc coated steel whereas the hood is made of aluminum alloy to ensure weight reduction and increase corrosion resistance. The selection of materials and production processes were selected and monitored thoroughly. The engineering group manager of the General Motors Corrosion Engineering and Labs, Mark Yergin said, “Silverado’s corrosion protection measures provide superior defense against elements in the environment, whether driving through farm fields, on construction gravel, or down a snow-covered highway. The new Silverado is our strongest truck yet, affording us the confidence that the truck will continue to meet customers’ needs throughout its life.” After getting these improvements and high end materials, the Silverado won’t get any corrosion and rust even after 28 years. The GM released some corrosion resistance strategies that they will then use for the production of 2014 Silverado. An all new body layout and structure to reduce corrosion. The doors and hood get an enhanced hem flange sealing, underbody flange sealing that keeps the joints dry and eliminates deterioration caused by moisture. The appearance and strength of the truck’s underbody components enhances due to the extensive and enhanced chassis corrosion protection. Anti chip protection to the lower parts of the trucks for extra protection from stones, dust and gravel. The goal behind these changes and improvements is just to provide a reliable and corrosion free for a long time on the road.